You can troubleshoot the UET tag by using the tracking status in Bing Ads or the UET Tag Helper Chrome Extension. 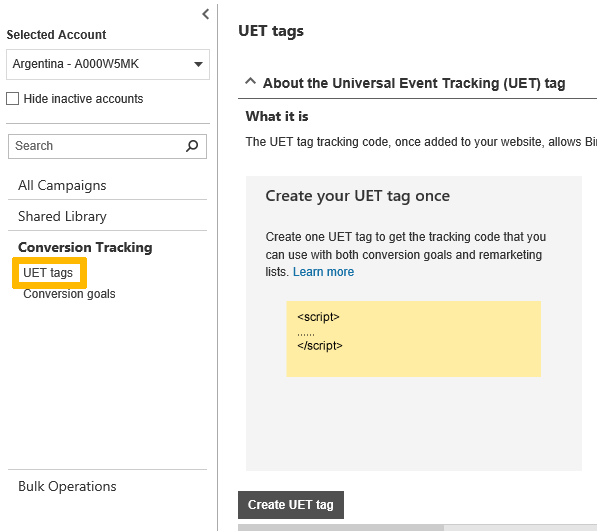 If your UET tag has been on your webpage for more than 24 hours, you can review the UET tracking status in Bing Ads to see if the tag is active or inactive and then you can use the UET Tag Helper in Chrome to check to see if your UET tag is working or not. Once you know that you have an issue with your UET tag, you can use UET Tag Helper to find out what the issue is and how to fix it. To learn more, see Find out if my tag is working with UET Tag Helper. Under Conversion Tracking, click UET tags. Review the Tracking status column. What it is: Bing Ads has not received any user activity data from the UET tag on your website. It can take up to 24 hours for Bing Ads to verify. If you still see this status, you either have not added the UET tag tracking code to your website or there is an issue with the setup that you need to fix. What it is: Bing Ads has seen your UET tag, but haven't recorded any conversions in the last 7 days. This is most likely because you either have created the goal incorrectly, have not tagged your entire website, especially the pages that have the conversion action or you don't have any users converting on your site. What it is: Bing Ads has not received any user activity data from the UET tag in the last 24 hours. Make sure that the UET tag tracking code is still on your website. Whether or not the UET tag has been installed across the site: Bing Ads reports status of the UET tag as Tag active as long as at least one UET event was logged (from any part of your website). 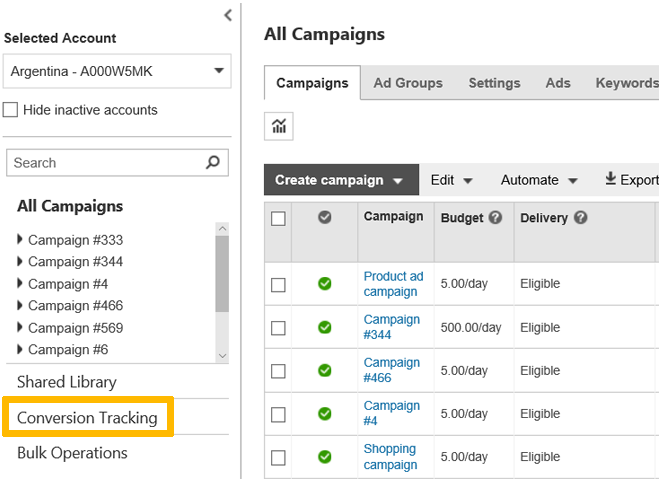 Whether or not custom events/variable revenue values are being reported: As explained above Bing Ads does not distinguish between page load events (logged by default) or custom events reported when the tracking status column. UET Tag Helper is a Chrome Extension that validates the implementation of the Bing Ads UET tag on any given webpage. To learn how to install and use the UET Tag Helper to validate UET tags, see Find out if my tag is working with UET Tag Helper.